Homalopsis sieboldii Schegel, 1837 Essai sur la physionomie des serpents, 2:349, pl. 13, Figures 4-5. Type locality: Bengal. Holotype: RNHL 1168. Collector: unknown. Ferania sieboldii - Gray, 1842 Zoological Miscellany, p. 67. Trigonurus sieboldii - Duméril, Bibron and Duméril, 1854 Érpétologie générale…reptiles, 7:960. Hypsirhina sieboldi - Jan, 1863 Elenco systematico degli ofidi, p. 78. Feraniodes jamnaeticus Carlleyle, 1869 Journal of the Asiatic Society of Bengal, 38:196. Type locality: Jumma River, near Agra. Holotype: Calcutta Museum. Enhydris sieboldi - Mell, 1929a Journal of Lingnan University Science, 1929b:253. Etymology: This species was named in honor of the German medical doctor and explorer Philipp Franz von Siebold (Schleich and Kästle, 2002). Common Names: The Ferania (Gray, 1849); Siebold’s Watersnake (Wall, 1908); Siebold’s Smooth Water Snake (Whitaker, 1978). Distribution: This species occurs in northwest peninsular India, Bangladesh, Nepal and extreme western Myanmar. All of the literature records with specific localities suggest this species is endemic to the Jumma, Ganges and Brahmaputra drainages. Swan and Leviton (1962) listed this snake as possibly being present in Nepal; Das, (1994) listed the species as present in Nepal but reports no specimens. Mark O’Shea (Personal Communication; 1998) believes he saw this snake in Nepal, he wrote “The Enhydris sieboldi I mentioned was captured in 1992 (exact date in field notes somewhere) in a fish gill net set on the eastern side of the Karnali River, just about 2km south of the Chisapani Gorge, on the edge of the Royal Bardia National Park in western Nepal. The habitat was low lying terai forest along slow flowing channels of a broad river…” This area is within the Ganges drainage basin. Shrestha (2001) stated that it occurs throughout Nepal, but its occurrence at medium or higher elevations in the Himalayas is improbable and the lack of specimens makes this statement questionable. Schleich and Kästle (2002) report a single record from Narayanghat, north of Chitwan Park. Wall (1924) mentioned the following localities in his account: Malabar Coast (also reported by Gharpurey, 1944), Travancore, Bombay, and Rangoon River, Pegu [Myanmar]. The Bombay locality is supported by BMNH 87.12.23.1, but this is an old record and may well be an error. I have found no evidence of specimens from southwest peninsular India (the Malabar Coast and Travancore), or the Ayeyarwady River drainage (the Rangoon River). Thus, this species range is problematic outside the Gnages drainage. Southern Indian records may be based on misidentified Dieurostus. dussumieri which has similar scale arrangements and scale counts. Flower (1896, 1899) and Gyi (1970) stated that this species occurs in the Malaysian Peninsula based upon a specimen Cantor obtained that was said to be from “Pinang.” The specimen, BMNH 60.3.19.1185, is a neonate sieboldii but it seems probable that the locality data is in error. Diagnosis: A homalopsid with 29 scale rows at mid-body that are reduced to 21 or 23 near the vent; it also has 143 - 147 ventral scales and 47 - 51 subcaudal scales. India has only two other recognized species of snakes previously placed in the genus Enhydris, E. enhydris which has 21 scale rows at mid-body, and Dieurostus dussermierii which has 27 rows. E. sieboldii has 3 - 4 lower labials contacting the anterior chin shields, while D. dussermierii has 4 - 5 lower labials contacting the anterior chin shields. Also, the anterior edge of seiboldii’s anterior chin shield is broader than the posterior end; the opposite is true for dussermieri chin shields. 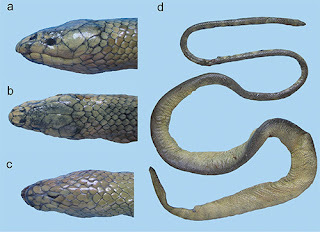 Mintonophis pakistanicus is restricted to the Indus River delta of Pakistan and it also has 29 scale rows at mid-body, extremely narrow ventral scales that number 156 - 168, and subcaudal scales that number 70 - 92. Homalophis doriae has 29 - 31 scale rows at mid-body and a ventral count that overlaps with seiboldii, however doriae has 11 - 16 upper labials while seiboldii has eight and in doriae the seventh or 7 - 8 upper labials are under the orbit, but separated from it by subocular scale(s). Feriana seiboldii has no subocular scales and upper labial number four enters the orbit. Additionally, H. doriae is known only from the island of Borneo. Size: The largest specimen measured was a female with a total length of 680 mm; it had a 105 mm tail, part of which was missing. Wall (1924) reported a 775 mm individual. A collection of five neonates (BM1907.2.14.32) have a SVL range of 172 - 191 mm (X¯ = 180 mm), and tail lengths of 35 - 41 mm (X¯ = 39 mm). However, the smallest individual was BM 60.3.19.1185, with a total length of 189 mm, and a 35 mm tail. External Morphology: The head is distinct from the body, the body is cylindrical, and the tail is slightly compressed. The eyes are small and positioned dorsolaterally. On the head the rostral scale is narrow, pentagonal and about as tall as it is broad. The nasal scales are small and in contact. The internasal is divided, posterior to the nasals, and slightly penetrating between the nasals; each of these scales is less than half the size of a prefrontal scale. The prefrontal scales are paired and more than twice the size of the internasal scale and about the same size as the nasal scale. The frontal is pentagonal, longer than the supraocular, and shorter than the parietals. The loreal is single, and in contact with the internasal, the prefrontal, and the first three upper labials. The supraocular and preocular are single; the postocular scales number two, with the upper scale being slightly taller than the bottom scale; there are no subocular scales separating the orbit from the labials, although the lower postocular does extend slightly below the eye; and upper labial four does enter the orbit. The temporal formula is 1 + 2, with the primary temporal being the largest. The upper labials number eight, with scales 7 - 8 being horizontally divided. On the chin the lower labials number 14, the fourth one is very small in the type specimen and contacts the anterior chin shield. There are two pairs of chin shields; the anterior pair is the largest in area and length. Three lower labials contact the anterior chin shield. On the body the dorsal scales are smooth and in 29 - 30 rows on the neck, 29 rows at mid-body, and 21 or 23 rows near the vent. The first row is slightly higher than the second row and the first two or three rows are more ovate than the rows closer to the midline. The ventral scales are broad and number 143 - 147. On the tail the subcaudal scales are divided and number 50 in the type specimen, but the tail tip is damaged. They number 47 - 51 in three neonate specimens of uncertain gender. At the base of the tail the width is 75% of the height, based upon an average of four specimens. Color and pattern. The pattern consists of about 20 dorsal, brown blotches outlined in dark brown on dorsum above scale row six. Scale rows 1 - 6 contain at least 25 blotches on a cream-yellow ground color. These extend to the outer edge of each ventral. The centers of the ventral scales are yellow. Diet: Virtually nothing is known about its food or feeding habits. Wall (1897) stated that a captive ate a frog, and another specimen died while trying to eat a fish. Reproduction: Wall (1908) reported a female with 5 embryos and 7 non-fertile eggs, the embryos were ready to be born, one was 7.5 inches long (182 mm). Predators and Associated Behavior: Mell (1928) described the passive defense posture and behavior of this species and notes that when touched it alternates between mirrored postures, and that it throws its body into the loose coiled position when disturbed.